The day began with grey skies and a pouring rain. That was the first image I saw when I looked out of the window of my motel room. I’d known it was going to be that way. New Zealand’s National Weather Service, Metservice, had said so the previous night, but I had gotten so use to the country’s fickle weather, that I hoped for another weather miracle like so many I’d already had- forecast for rain, only to see sunny skies magically appear. This day didn’t look like one of those, however, as I again consulted Metservice and the radar before I headed out. As I loaded up the campervan, the rain was coming down so hard that I briefly debated just turning around and heading back to Auckland, but I had come this far. 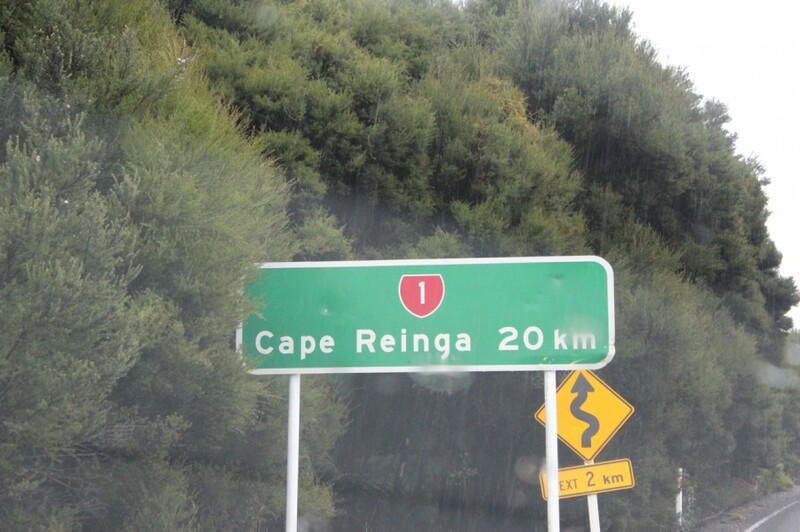 Rain or not, I was going to Cape Reinga. 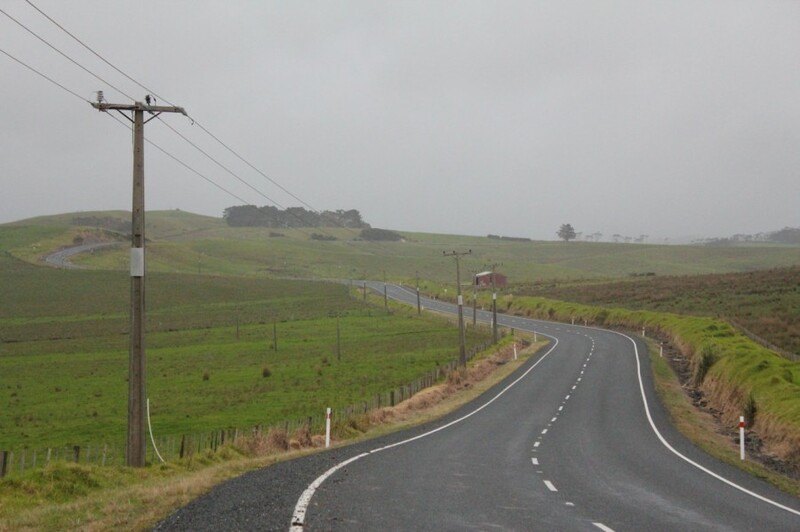 The road to the cape stretched for over 110 kilometers (68 miles) from Kaitaia, passing through mostly farmland, with only the smallest of communities along the way. 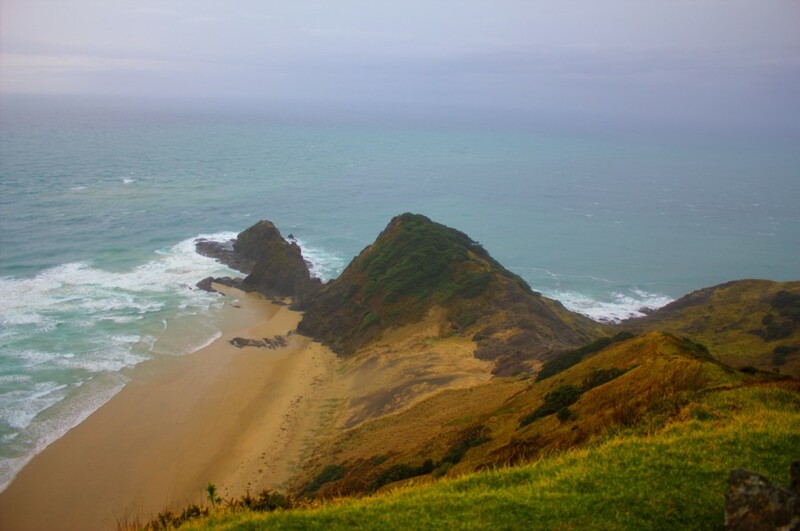 As with most of the roads I’d traveled in New Zealand, the way zig-zagged up the Aupouri Peninsula. Combining that with the torrential downpour I had most of the way, slow progress was made. The last 19 miles of the road had only finished being paved back in 2010. When I passed the sign indicating the last 20kms of newly sealed road was ahead, I had drifted into a pretty foul temper. 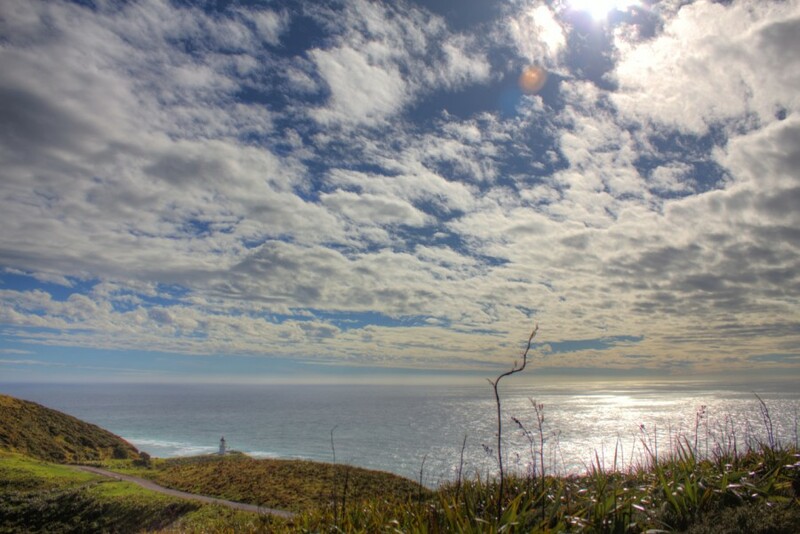 I’d dreamt about my day at Cape Reinga, and despite it’s rainy reputation this time of year, I still had never grasped the reality that the day would be like this, and not one with the clear blue skies above an idyllic sea that I’d envisioned. The whole trip I’d stayed ahead of schedule, knowing that doing so would be the only way I would have the days left at the end of the trip to make it all the way up here. As I approached the cape, in the steady rain, I remember being so angry with myself over all the destinations I’d cut time from so this moment could happen- and this was going to be the result. There was only one other car in the carpark when I pulled in. I got into the back of the campervan to start doning my rain gear. It was raining to hard for me to take my good camera with me, so I grabbed my small point-and-shoot and headed out. As I stood reading the first few information boards at the top of the hill, I realized it had briefly stopped raining. I hustled back to the car and grabbed the good camera, then quickly took off on the path heading downhill to the lighthouse, intending to take advantage of the cessation of the rain I’d driven through. The skies told me it wouldn’t last long. 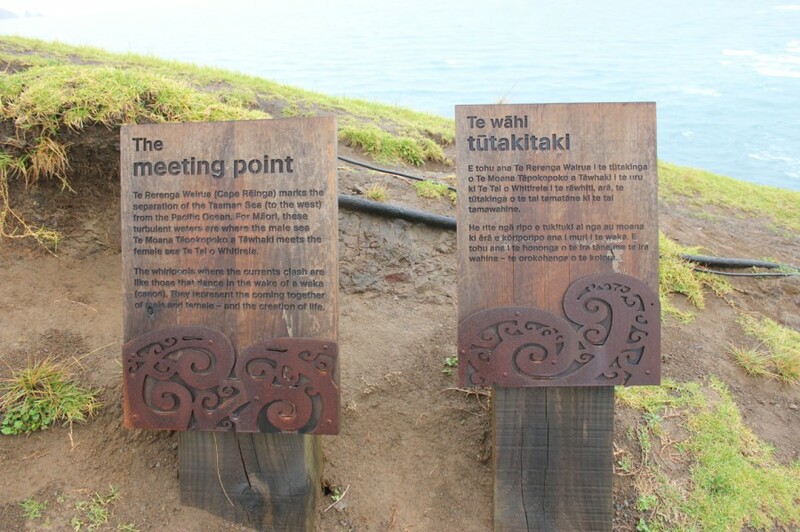 Part of my obsession with visiting Cape Reinga was the Maori belief that this most spiritual of places was where their spirits leave the island. 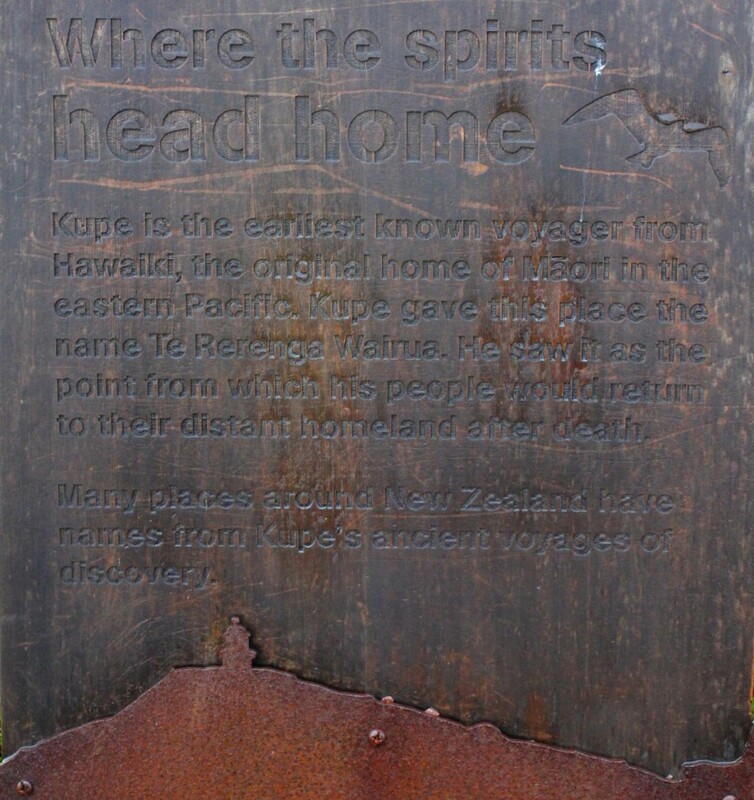 The Maori believe that all of their spirits travel here upon their death, traveling across the windswept plain and out to headland of the cape to the lone pohutukawa tree. It is at this tree that the spirits descend to the underworld by sliding down a root of the tree. 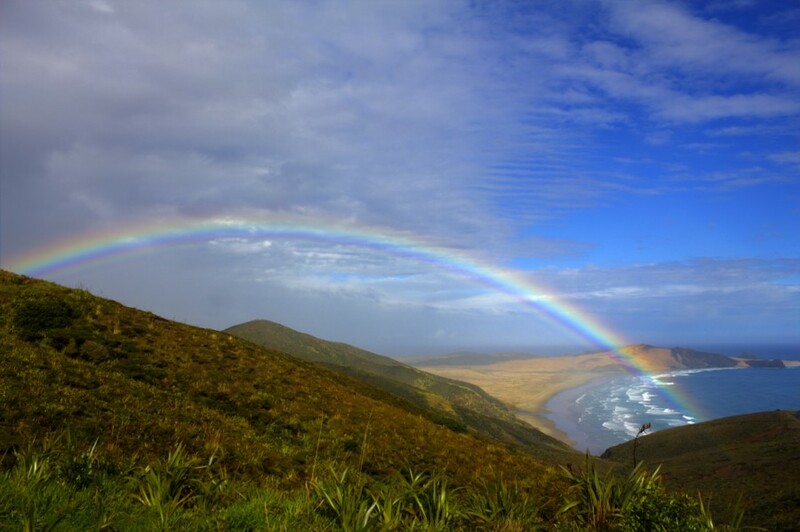 They then travel underwater to Three Kings Island, located a couple kilometers offshore, where the visit the island’s highest point to bid one last farewell to Aotearoa before traveling to Hawaiiki-A-Nui, the land of their ancestors. It is a beautiful legend, and it’s spirituality resonates all around this place. 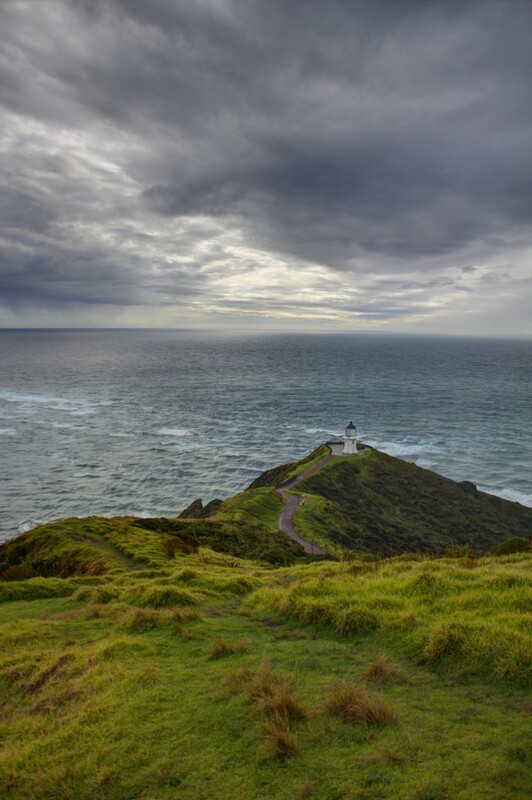 The Cape Reinga Lighthouse stands at the tip of the peninsula, guiding ships through this dangerous passage since it was first lit in 1941. 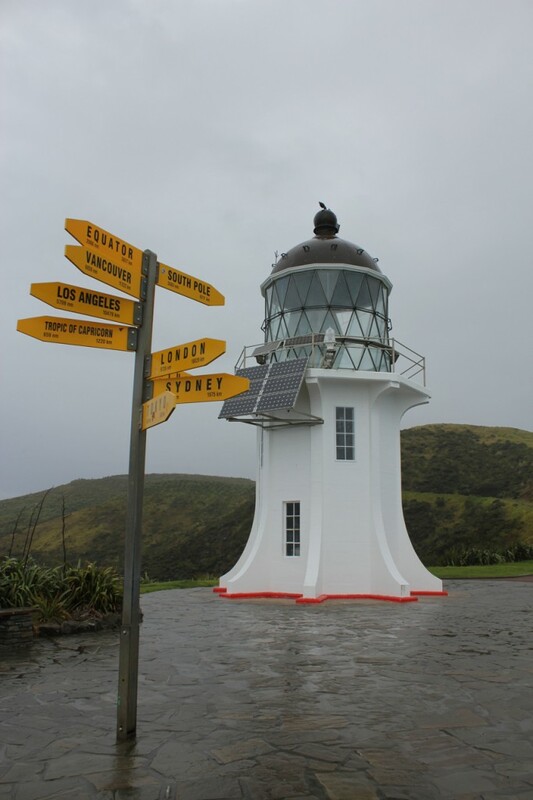 It’s last lighthouse keep left in 1987, and it has been an electric lighthouse ever since. There is something comely and understated about the lighthouse, almost as if it does not want to take away from the spirituality of the cape. 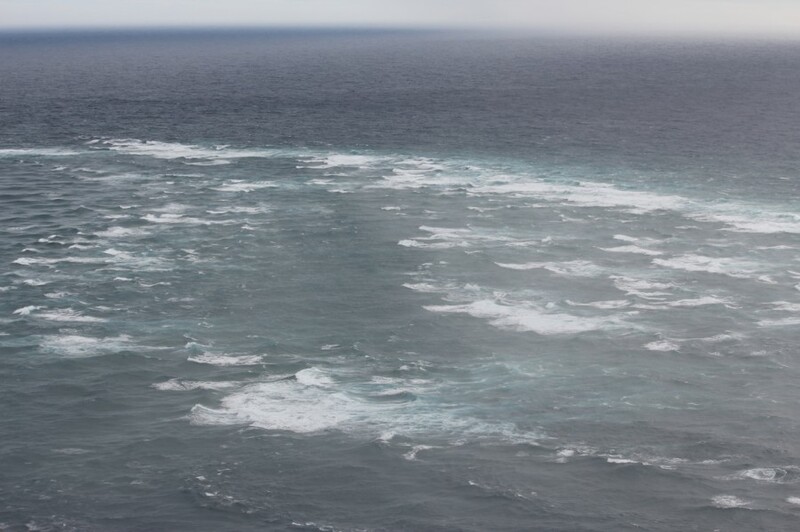 Another truly unique feature of Cape Reinga is the meeting of the Tasman Sea and Pacific Ocean that takes place just offshore. It is a truly unique phenomenon to watch the waves of these two bodies of water come together in a turbulent swirling of water. I lingered for quite a while out at the lighthouse. 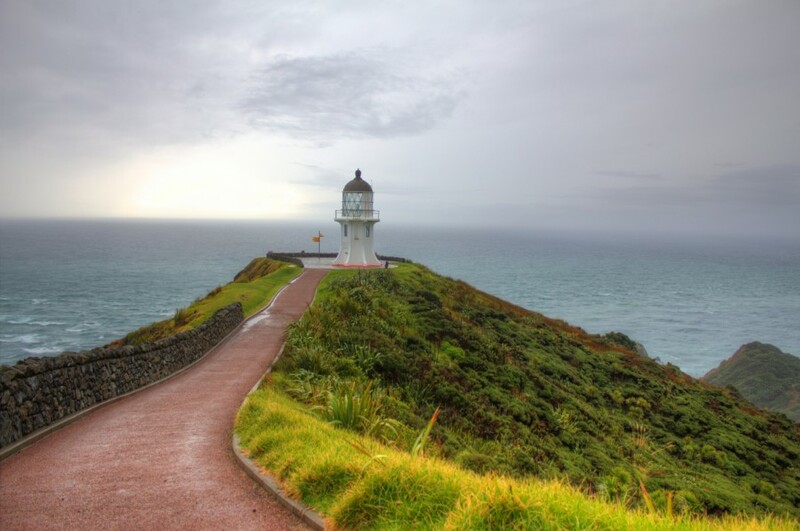 For much of the hour I was there taking pictures, observing the surroundings and rereading the Maori legends, I had the lighthouse platform to myself. The rain stopped for a while then would start again, but only in a light drizzle. Considering what I had driven through to get here, I wasn’t complaining. My mood had gone from brooding to pleased with the decision to make the drive, when the spirit of the north had one more gift in store for me. As I began to walk back up the hill to the car park, a single ray of sunshine warmed my back as I walked away from the cape. 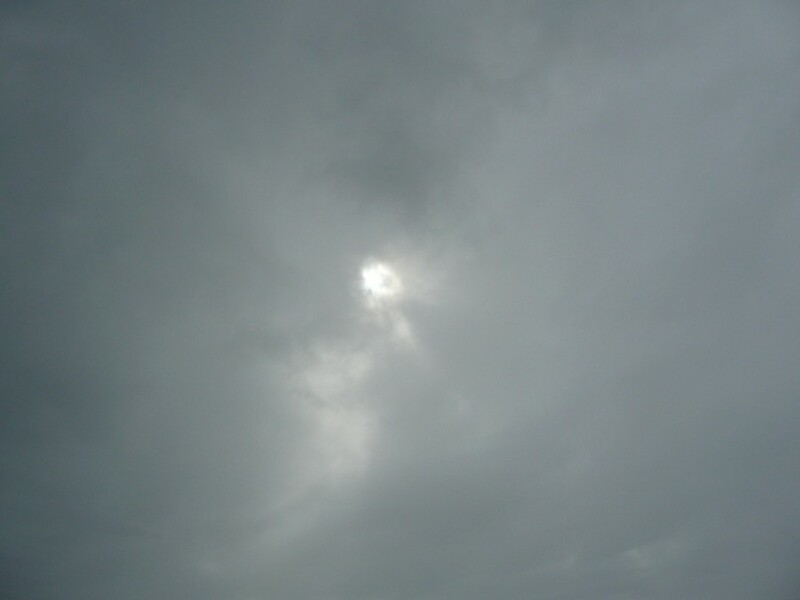 I whirled around to see the sun attempting to peak through the breaking clouds. 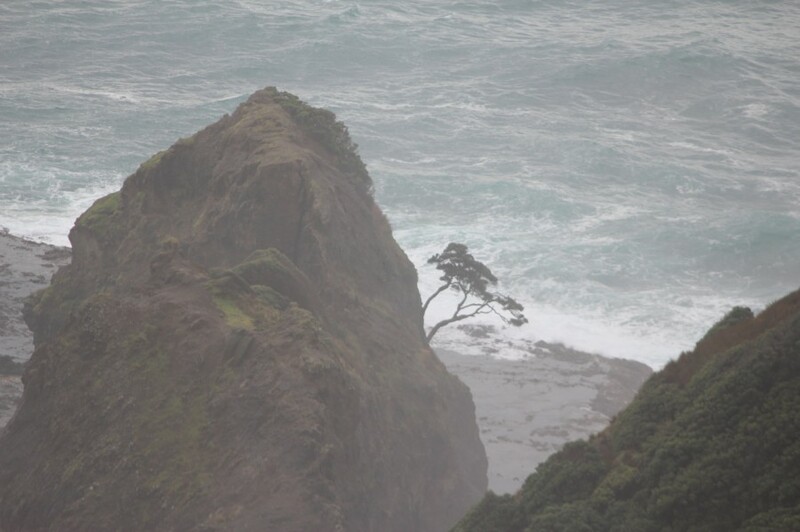 I, by now, on the twenty-sixth day of the trip, had come to never assume anything from New Zealand’s weather. Instead of returning to the car park as planned, I hiked up to the top of the hill that gave a gorgeous panoramic view of the whole area. I sat down and waited to see if the skies would clear. Sure enough, the skies broke. A beautiful rainbow formed over Spirit’s Bay just to the west of the lighthouse. On a trip where I saw twenty-seven different rainbows, this one was the brightest and most vivid. I sat on top of that hill, admiring the rainbow, soaking in the atmosphere of the place for almost another hour. I could have stayed another two, but I also wanted to spend some time at the sand dunes and on 90 Mile Beach. 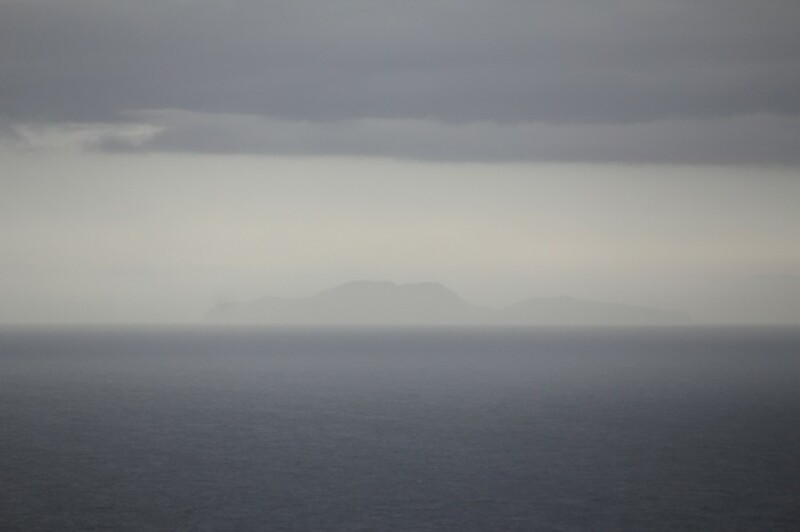 As I drove away from Cape Reinga, tears rolled down my cheeks. What an incredible land, what a deeply moving and spiritual place. I’d been given so many gifts during my time in New Zealand, this extra special one was the icing on the cake. 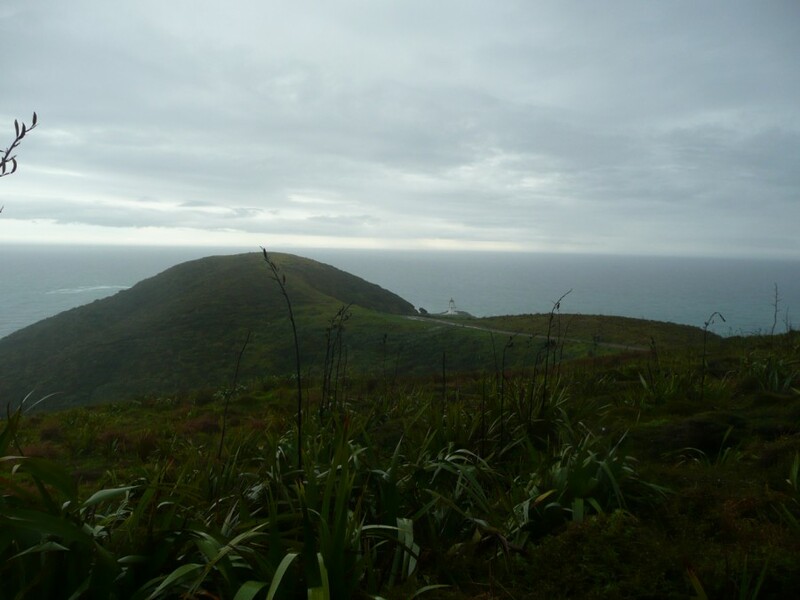 The Maori believe their spirits leave the island at Cape Reinga, and I know I had a part of mine strengthened there. Amazing, Erik! I am sooo glad that it was worth the drive, and that the Cape was able to show off its amazing beauty. They say patience is a virtue, hey! And how beautiful to have the lighthouse ALL TO YOURSELF! That’s a gift in and of itself, and a rare one at that. Beautiful post, my friend, stunning photography. It was a singular day for sure (and I still have the second half of the day to write about! 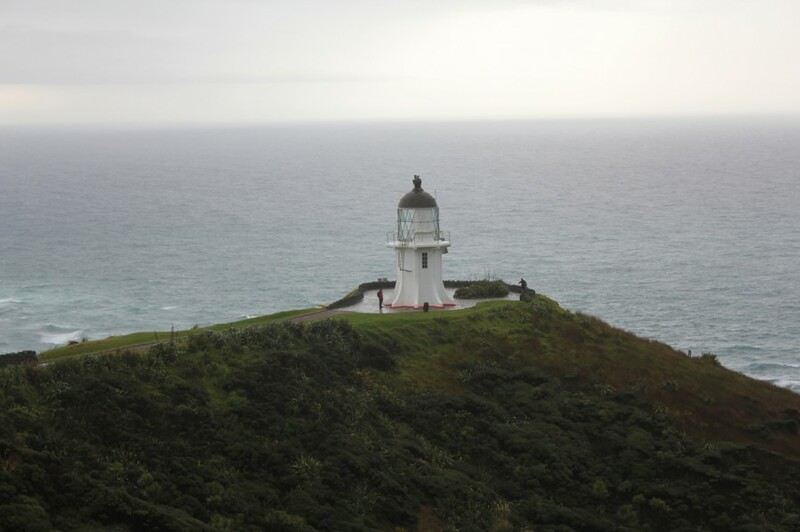 After visiting I can see why so many people take that long, slow drive up to Reinga. I’m just glad I don’t have to go THAT far everytime I have to go to Auckland…. the 4 hours is bad enough! Ohhhhh, yes… I’ll be writing about that SSSSLLLLOOOWWW drive a couple posts from now…. Thanks, Deej. Glad to know I got it right 🙂 this one was very important to me! A great legend and a beautiful place. The rainbow was certainly an added bonus. I ws shocked at how often I saw them in New Zealand!